The British-flagged and British-crewed, 5,258-ton motor freighter Anglo-Canadian was built by the Short Brothers Limited at Pallion, Sunderland, England, in July of 1928. She was owned by the Nitrate Producers Steamship Company (Lather, Latta ad Company) of London. At 123.84 meters overall and 17.68 meters wide with 7.53 meters draft, she was powered by two oil-fueled engines with a combined n.h.p. of 598. Before Wilfried Reichman in U-153 encountered her southeast of Bermuda and some 800 miles northeast of Antigua on the 25th of June 1942 the Anglo-Canadian had experienced an eventful voyage. While her crew of 50 under the leadership of Captain David John Williams were waiting to discharge cargo in Vizagapatnam (Vizag) in the Bay of Bengal on the east coast of India, the ship was bombed by Japanese aircraft on April 16, 1942. The captain kept up evasive maneuvers for two hours while the plane attacked in the anchorage, or roads, off the port. Having discharged in India, the Anglo-Canadian set sail for the US eastern seaboard via South Africa. She left Cape Town on the 3rd of June and called briefly at Ascension Island. Her final destination was to be Baltimore, Maryland. On the 24th of June at 1 pm local time the Anglo-Canadian was struck by a torpedo from U-153 in position 25.12N and 55.31W. The men were able to send an SOS which picked up by the nearby Putney Hill (which itself was found and sunk by U-203 under Rolf Mutzelburg two days later on the 26th of June). 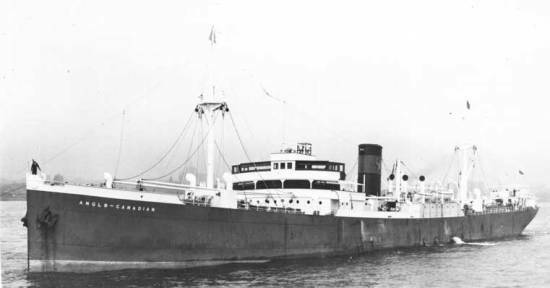 Once the Anglo-Canadian sank Reichmann cruised among the wreckage with the submarine’s spotlight on in order to enable the survivors to make it to safety on boats and rafts. The 49 survivors divided into two life boats. Third Radio Officer Leo Maurice Housley, aged 18 was the only crew member killed, and his body remained on the ship.